For women who conceive very easily, it is very hard for them to understand the plight of a woman who is involuntarily childless. I will cover some statistics from different sources. Most will come from a chapter in the book called, “Woman: A formula for victorious living” by Lu Ann Bransby. Nearly 1 out of every 6 couples in the U.S. suffer the anguish of being childless. For millions it’s a physical problem or hormonal. About two-thirds of infertility cases can be REVERSED through new medical techniques. It’s the husband who turns out to have the physical problem in up to 40% of all infertile couples. Some men have a severe reaction because he falsely believes he is not a complete man since his masculinity is involved. Infertile couples can pursue other alternatives knowing that God will BLESS every effort they undertake in His name. Many couples clam up about their situation but this is the time that they need to receive from other Christians. Women should not feel they are a disappointment to their husbands. Couples who put all their faith and trust in God find their relationship strengthened. Their situation brings them even closer together. Some couples become consumed with their infertility. Their longing for a child swallows up the joy in their lives. Being childless is not the end of life, health or happiness. Those words remind us that everything is in conformity with God’s purpose and will, even infertility. A couple’s infertility will somehow serve God’s purpose and bring GLORY to the Savior’s name. What do infertile couples do? Being childless can be met head-on by Christian couples in exactly the same way that they might address any other challenge in life. Call on God in PRAYER. Phil.4:6 “Do not be anxious about anything, but in everything, by prayer and petition, with thanksgiving, present your requests to God.” Prayer can help infertile couples to deal with insensitive people. Prayer reminds Christians that God holds all of us in the palm of his hand. They can be happy also knowing that God has a PLAN for their lives as well. Contentment with your path in life is always God-pleasing. A barren womb is never God’s fault! 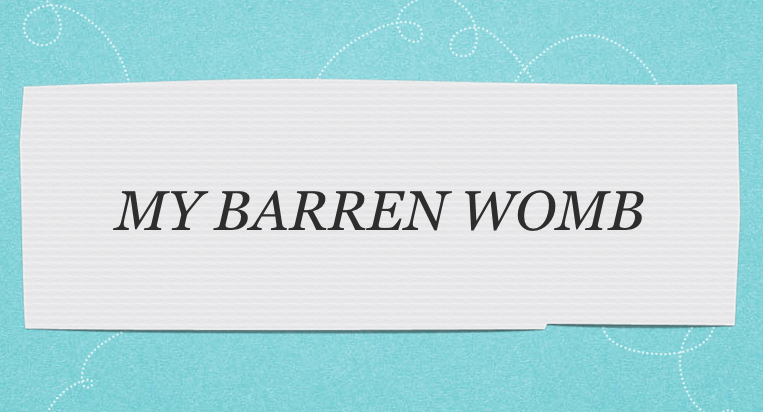 What barren women should do. 1. Pray consistently for God to heal you or your husband’s body. 2. Constantly read the scriptures. 3. Take complete inventory of your lives. 15. Get rid of sin in your life. 19. Put all bitterness aside. THE GREATEST GIFT YOU CAN GIVE A WOMAN WHO IS BARREN, OR HAS HAD A MISCARRIAGE, IS INTERCESSORY PRAYER!